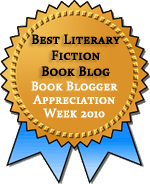 Have you ever noticed how hard it is to review a book when you can’t pinpoint what genre it is? I started writing about All Over Coffee, by Paul Madonna, and stumbled right out of the gate. It’s not a graphic novel. It’s not comic strips. It’s certainly not memoir or biography, and not exactly illustrated nonfiction. I believe this might just be genreless, its very own exquisite thing. 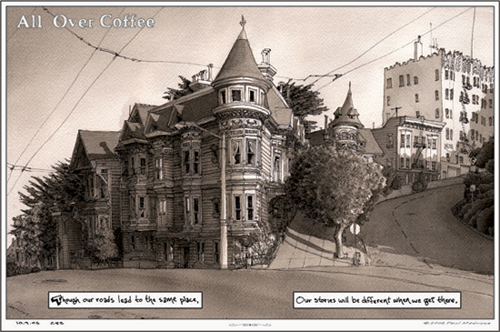 All Over Coffee is a series of beautifully detailed, delicate pen-and-ink drawings of San Francisco. Some are panoramic views of the city. Some are tiny details of architecture: Victorian turrets, bay windows. Others are views of a familar street corner or a neighborhood bar or a coffee shop (naturally enough.) Rarely are there any people in the pictures; occasionally birds or bicycles, but few signs of human occupancy. The drawings are sepia-toned, with the occasional, startling hint of color: a hit of red on a stop sign, or a yellow rubber duck in a thrift-store window. The human aspect comes with the words that accompany the pictures: thoughts, oddities, observations, drifts of overheard conversation. The words, broken into the panels of the strip format (All Over Coffee originally ran as a daily strip in the San Francisco Chronicle), have the quality of found poetry: “A man clips his fingernails on a jostling electric bus beside him, an abandoned newspaper / Above the fog, it’s a sunny day” The pictures that accompany the text have nothing to do with the text itself. Sometimes Madonna tells stories (my own favorite was the ex-gambler found at the laundromat, putting quarters in the machines just to hear the sound — his wife thought he could at least get some laundry done while he was there), but he’s at his most delicate, and his most effective, when he stands back and lets his readers insert their own stories and experiences into his lovely, empty pictures and aphoristic text. I was bowled over by this book, and if you can get your hands on it, and especially if you love San Francisco, I recommend you give it a try. This entry was posted in Graphic Novels / Comics. Bookmark the permalink. This looks so beautiful! But before reading your review, I scrolled down and saw “Madonna tells stories” and had the fear! How can I say! Well, thank heavens it is just a last name… Anyway, I too struggle with defining books that cross genres, and am looking for an appropriate word to say poly-genre-d, or multi-genre-d (the d transforms the meaning though so you can’t add it), or genre of many colors…. This one, I think, is less poly-genre than just sui generis. I’ve never seen anything quite like it. See if you can get a copy and you’ll see what I mean. He has a website! And I had fun spending time checking out all the pictures/comics/whatever they are. Aren’t they gorgeous? There’s no narrative arc, so reading them in a book format doesn’t either add to or detract from the experience, but the book is beautiful. 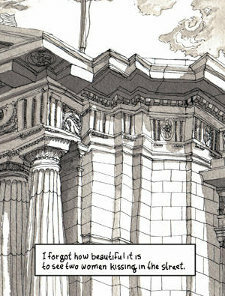 I’m a big fan of graphic novels with a strong focus on architecture (François Schuiten in particular), so this seems just the type of this I would enjoy. Oh, yes — not to sound flippant, but if this is the kind of thing you like, then you will like this. :) Really, you should look for a copy. It’s intriguing and exceptionally beautiful. The illustrations are so detailed and gorgeous. Lovely book.